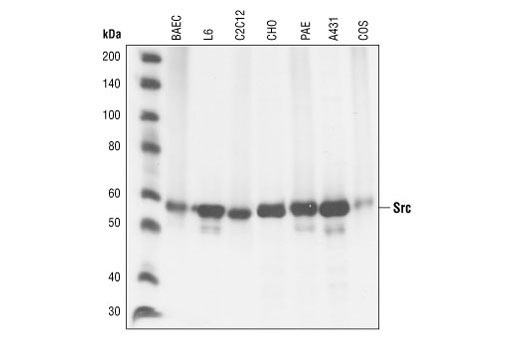 Western blot analysis of extracts from various cell lines using Src (36D10) Rabbit mAb. 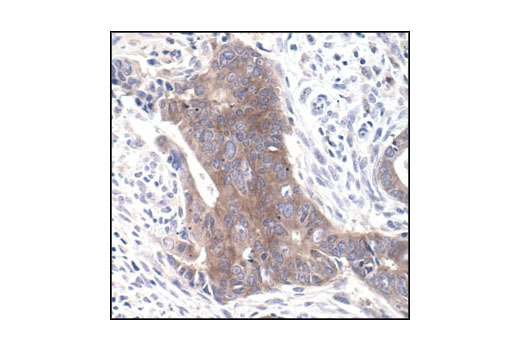 Immunohistochemical analysis of paraffin-embedded human colon carcinoma using Src (36D10) Rabbit mAb. 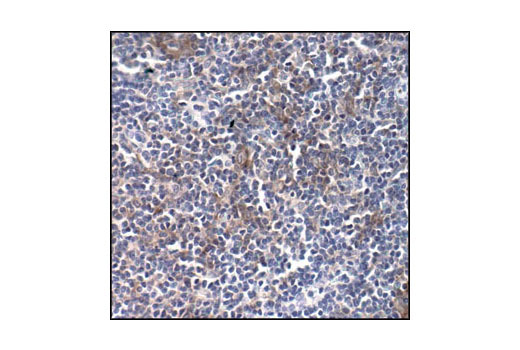 Immunohistochemical analysis of paraffin-embedded Non-Hodgkin's lymphoma using Src (36D10) Rabbit mAb. 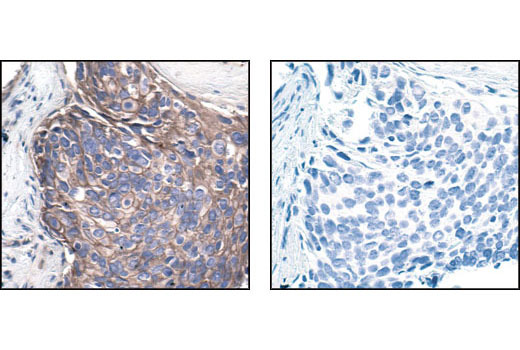 Immunohistochemical analysis of paraffin-embedded human breast carcinoma using Src (36D10) Rabbit mAb in the presence of control peptide (left) or Src Blocking Peptide #1235 (right). 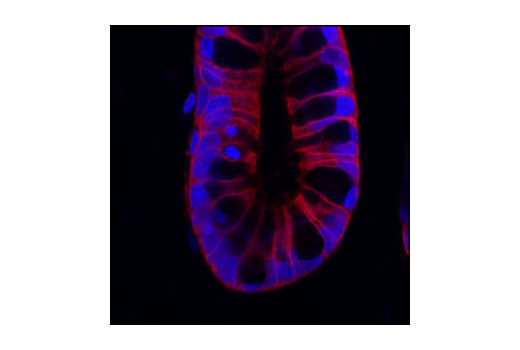 Confocal immunofluorescent analysis of rat colon labeled with Src (36D10) Rabbit mAb (red). Blue pseudocolor=DRAQ5® #4084 (fluorescent DNA dye). 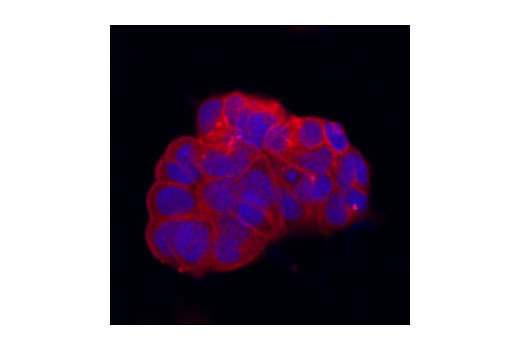 Confocal immunofluorescent analysis of MCF-7 cells labeled with Src (36D10) Rabbit mAb (red). Blue pseudocolor = DRAQ5® #4084 (fluorescent DNA dye). Flow cytometric analysis of A-431 cells using Src (36D10) Rabbit mAb (blue) compared to a nonspecific negative control antibody (red). 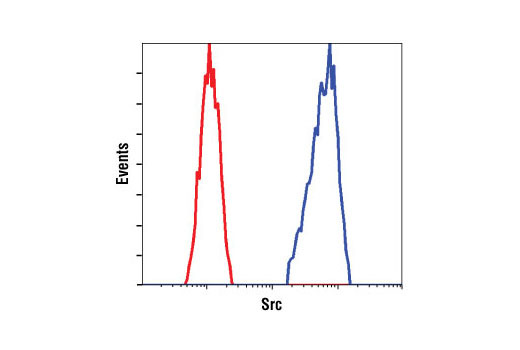 Src (36D10) Rabbit mAb detects endogenous levels of Src proteins. The antibody may cross-react with other Src family members, but does not cross-react with other non-family proteins. Monoclonal antibody is produced by immunizing animals with a synthetic peptide corresponding to residues near the carboxy terminus of human Src.